We’d love your help. Let us know what’s wrong with this preview of First Contact by J.M. Dillard. From the deepest, darkest reaches of space came the greatest threat the federation had ever faced: the Borg. Half organic/half mechanical, the Borg were relentless and bent on conquering and "assimilating" all intelligent life; a single Borg vessel destroyed 39 Federation starships, decimating Starfleet.Stronger and more dangerous than ever, they are ready to launch a new From the deepest, darkest reaches of space came the greatest threat the federation had ever faced: the Borg. Half organic/half mechanical, the Borg were relentless and bent on conquering and "assimilating" all intelligent life; a single Borg vessel destroyed 39 Federation starships, decimating Starfleet.Stronger and more dangerous than ever, they are ready to launch a new attack against the Federation, one that threatens its past... its present... and its future. Does anyone know why this book isn't on Kindle? All the other Star Trek movie novelizations are, as is the YA version. Gates McFadden is not appropriate as the pov of Picard. I think they wanted her to represent the Borg, but this makes the audiobook unlistenable. Still intend to try the physical copy. Even though this was an abridged audiobook, it didn't feel like it, and filled in the movie in great and unexpected ways. So, not my favorite movie (that's still Generations! ), but loved the book. Fun and quick read. Lots of action. Stigmatizes mental illness. A quick and easy read. Nothing special but it did fill un an interesting part of Star Tek universe history. I like J.M. Dillard's novelizations of Star Trek movies and episodes. She stays true to the details of the filmed version but adds a nice level of description and details as well. My favorite part of this is actually the opening few paragraphs when she is describing the Borg ship. Otherwise the plot is the same as the movie version. My mother wouldn't let me go see this movie when it originally came out (I was 12 and it was rated PG-13, yeah, she was overprotective), so I read this novelization f I like J.M. Dillard's novelizations of Star Trek movies and episodes. She stays true to the details of the filmed version but adds a nice level of description and details as well. I really liked the movie, and this book did a great job of translating the fun and the action to book form. J.M. Dillard writes really well. On top of that, she was able to enter the characters' heads and add in even more emotional depth, such as providing more backstory for Lily and revealing Zefram Cochrane's struggle with bipolar disorder (and even added info on the eradication of mental illnesses prior to World War Three). Another enjoyable step through cinematic Trek history! As noted, I'm enjoying reading these books - reliving the movies with my own imagination and that of the author. The fact Dillard did the final movies - from V onward, including all the TNG movies, works so well - she maintains themes from one book to the next, while she fleshes out the story. I've also appreciated the afterwords that discuss the decision-making process behind the movie development. This one loses a lot in the transition from the big screen to a book. The screenplay, with is action and adventures, is simply better seen than read. (Plus the film has a killer score.) Dillard tries to compensate by adding more information about the characters, but the backstories of the guest stars seem shoehorned in, and they don't add a lot to the story. The book's okay, but the film is much better and the definitive way to experience this one. Reading a book is always strange after you watch the movie because your ability to imagine the characters is a wee bit shot. In the case of STNG it was obliterated. This was my favorite show when I was a tween. It was interesting to read because I could hear each and every character's voice as portrayed by the actors known for the role. Totes fun experience. A good quick read. If you saw the movie, then you've already read the book. Only the movie looks better. The novel itself compromises the first 246 pages. The balance is a PR blurb about the making of the film. The area some photos and illustrations. Some of these are a little disappointing. Of the thousands of pictures you could have selected, some of these are quite mundane. Excellently done. As a huge fan of Star Trek this was the first of any Star Trek book that I actually read. It follows the movie almost exactly yet reading the book brings you even closer to the story as if you were a member of the federation. I don't believe a better Star Trek book exist. This book was a pleasure to read and predictable like a lot of Star Trek books. 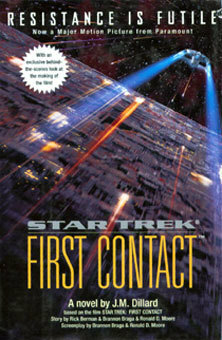 This book is based on the movie "First Contact" and I read it before the movie. I love doing that and this book set the stage me; I hope the movie is just as good. Much better than I expected. Actually, it was really, really good. It's a book of the First Contact movie, and it follows the movie very closely, but goes into more depth with Picard's psychology with the Borg and some other things only a book can do. I enjoyed the characters though they could have been developed a little bit more. I think I have read an earlier book by this author that had this story as part of their history. It felt familiar. I really enjoyed this story and I am looking forward to reading the rest of the connected series. I watch the movie first and I felt that the book did not give to much more insight they the movie showed. I thought the author got the relationship wrong between the Lt.Worf and captain Picard. I read this book back in 1996 and read it once, it's alright but it only at so and so level. Nothing magical or amazing about it. I really love how Picard is portrayed in this book, much darker than he normally is. You get to see a whole new side of the Borg in this books, which I've always enjoyed. Why isn't this on Kindle? All the other Star Trek movie novelizations are.